Think pro athletes get handed megabucks as soon as they ink a deal? Think again. Without the demands of agents, players would be making a lot less. But big contracts don’t come without conditions. Find out how athletes win (and lose) major deals. Take the quiz. 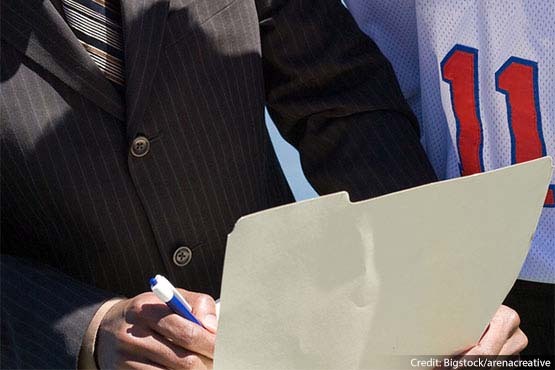 What do athletes agree to when they sign their contract? Contractually, the NBA doesn’t ban players from recreational sports, but it does discourage players from activities like skydiving, which could lead to injury. Hiking, swimming and beach volleyball are acceptable activities. What unusual request did former San Diego Padres star Phil Nevin make when he signed a four-year, $34 million deal in November 2001? Nevin’s contract included an incentive clause stating he could leave and become a free agent if construction, which had stopped, on a new downtown ballpark for the team did not resume within one year. NFL quarterback Matt Leinart in 2006 signed a six-year, $51 million contract with the Arizona Cardinals that included a last-minute $3 million incentive clause if he did what? A clause inserted by agent Tom Condon guaranteed Leinart an extra $3 million if he showed up at practice. What retired baseball player injured his right knee while dancing at a friend’s wedding? Detroit Tigers infielder Lou Whitaker tore cartilage in his knee while doing the splits, ending his 1988 season. An NFL, NBA, MLB or NHL team member can engage in a risky sporting event. All he needs is his team’s written permission. The team’s permission isn’t easy to get, but an athlete who has one is contractually allowed to engage in a risky activity. In January 2004, New York Yankee Aaron Boone injured his left knee playing pickup basketball. His one-year, $5.75 million contract with the Yankees was cut short, leaving him with how much? Boone, who allegedly didn’t know his contract prohibited playing hoops, received 30 days of termination pay, about $917,000. Chicago White Sox pitcher Eddie Cicotte could have gotten a $10,000 bonus if he had won how many games in 1919? Cicotte could have received a $10,000 bonus, worth about $170,000 now, if he had won 30 games. His career high was 29 amid controversy caused by the infamous Black Sox Scandal. If defensive end Mario Williams finished in the league’s top five in sacks, or got 12 sacks in any one season, his six-year deal with the Houston Texans would grow from $54 million to how much? The value of Williams’ deal would grow to $62 million. In 1972, Oakland A’s owner Charlie Finley inserted a clause in each player’s contract offering him $300 if he did what? Finley was trying to make the team look more rebellious by getting players to grow facial hair. Ironically, the look soon after became popular with the public. What did Cleveland Browns tight end Kellen Winslow Jr. do in May 2005 that cost him the entire 2005 NFL season? On May 1, 2005, Winslow suffered a leg injury when he was thrown from his motorcycle while riding in the Cleveland suburb of Westlake. I think that the pro-athletes should not get “big bucks” for inking a deal it just doesn’t seem fair too all the others. Could you be a sportscaster?